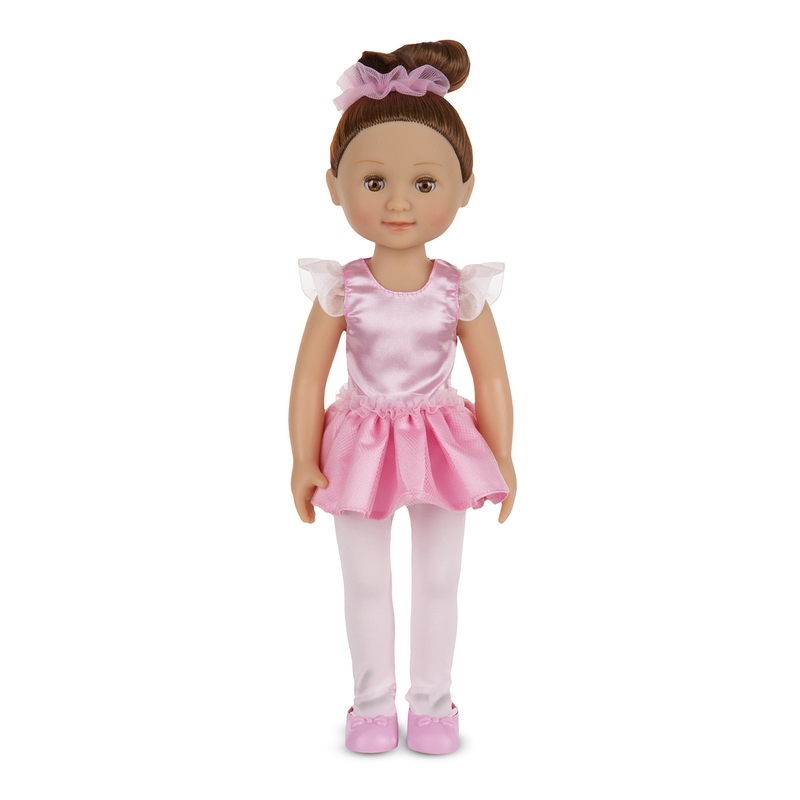 Victoria Ballerina Doll by Melissa & Doug was a much loved doll by one of my Granddaughters. She was dressed and undressed. She was dragged from one place to another. Often her hair was attacked and restyled. All awhile she was loved. Victoria Ballerina Doll is 14 inches dressed in a leotard, tutu, tights and ballet slippers. Her ballet bun is held with a ruffle. Her legs and arms can be poseable and put through her ballet moves. If there is a down side to Victoria Ballerina Doll it is that her hair is very hard to get back into a bun once combed out. Never the less my Granddaughter went at her hair often and she truly loved this doll. Very cute and sturdy play doll for young girls. She looks like a young girl, not a sophisticated older woman like some 14″ brands. She can wear most A.G. and other 14″ doll clothes. My only complaint is that her feet are too big for the shoes that come with the other brands’ outfits, so she only has what comes on her feet. Also,some tights are a little tighter to put on than they could be. It would be great if Melissa & Doug would put out some clothes and (especially!) shoes for their 14″ dolls.. This doll is beyond beautiful. The outfit is adorable. The hair is adorable. My daughter is currently in dance class and she takes this doll with her so her doll can watch her dance. The doll looks just like her so it was worth every penny to me. People often mistake the doll for an American Girl doll. The only con is that the ballet shoes do not stay on. We did a simple fix and sewed the shoe to the tights in the back. Problem solved!!!! Got this doll for my granddaughter and she loves it. It is just the right size and not soooo expensive that you can’t afford it. You can get additional clothes off of Etsy. I’ve practically gotten the whole wardrobe for this little doll. She is well dressed indeed! Every time my granddaughter comes over, we have to play dolls. A grandma’s dream! I thought the doll was a bit pricey, but once I received it and saw it in person it’s so worth it! Bought it for 18 month old and she loves to play with this doll. Doll is easy to move and position and play dance with. Victoria Ballerina Doll can be purchased at melissaanddoug.com.